A "tear-able" collection featuring one of the greatest tricks in magic! If you could have one set of magic videos, this would be it! This benchmark collection features just about all of magic's most enduring and classic effects and routines. 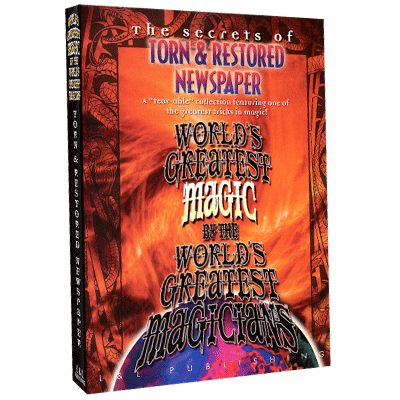 It's a fabulous compendium with many of the top masters in the world of magic teaching their handlings and routines for some of magic's classics. Linking rings, sponge balls, metal bending, cups and balls, thumb tips, Zombie, color-changing knives, and many, many more topics are all gathered in this one terrific video reference set. Each volume covers a specific subject and features new, old, and sometimes rare footage by some of the top video producers in magic. One of magic's most enduring effects has always been the Torn and Restored Newspaper, and for good reason. Newspapers and magazines are objects that almost everyone interacts with on a daily basis so when a magician picks up one of these seemingly ordinary items and performs a highly visual, veritable miracle with it, people immediately take notice. On this video, you'll meet six master magicians who each has their own singular take on this magical classic. Paul Potassy's continental style of performing in no way prepares the audience for the diabolical trap he sets for them as he not only tears up and restores a newspaper, but in offering to explain how it's done, leaves the audience even more baffled. Fielding West uses the Al Baker Newspaper Tear as a jumping off point for some great comedy and classic magic while Richard Osterlind actually has the newspaper signed before tearing it up and completely restoring it. Steve Dacri then passes along an underground trade show secret shown to him by Frank Garcia - a show-stopping trick with a page torn from a magazine that's torn and restored and verified to be the original page by a piece entrusted to a spectator at the very start. Next, Alex Elmsley's timeless newspaper tear is performed and then meticulously explained by the master himself. Finally, Terry Seabrooke shares a newspaper tear gag that is a perfect bit for magical MCs or as an interlude in any comedy magic act. Almost no other effect says "magic" like the Torn and Restored Newspaper and you're sure to find a version of this timeless trick here that's just perfect for you and your style of performing.